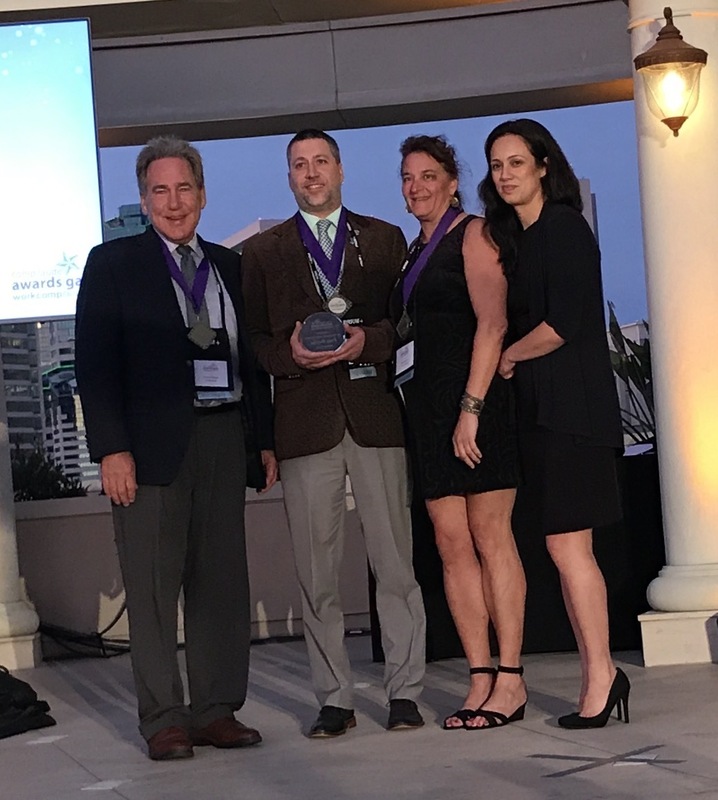 Craig Hospital received the Comp Laude Medical Facility Award at the 6th annual WorkCompCentral conference and gala held in San Diego in early November. Awards were presented for outstanding contributions to the workers’ compensation industry. Craig was nominated for the award by Stacy Whalen of Safety National for work with an injured police officer. The Comp Laude® Awards, meaning “with honor,” were presented to 11 individuals and companies representing numerous segments of the workers’ compensation industry, including injured workers. Conservatively, Craig has treated more than 5,000 workers compensation patients with catastrophic spinal cord injury(SCI) or traumatic brain injury (TBI) since 1956. In addition to serving workers injured in falls, motor vehicle and industrial accidents, Craig also has special expertise in working with law enforcement officers, firefighters and first responders injured in the line of duty. In the past two years, Craig experts have delivered six webinars on SCI and TBI for workers compensation audiences. Craig advocates for all of its patients, including those covered by workers compensation, health plans, Medicaid, Medicare and Tricare military. The Craig Hospital Foundation raises money for patient assistance funds, including necessary equipment and services that insurance might not cover. The hospital has on-site housing for families at no charge for 30 days, a robust therapeutic recreation program, nine full time Ph.D. psychologists for 93 inpatients and 55 outpatients, 15 master’s level counselors, a full-time chaplain, return to work program, driving/transportation programs, and three dozen specialty clinics and programs not found in other rehabilitation hospitals. “Craig is a comprehensive return-to-work and return-to-live program of bravery, hope and possibilities,” Hosack said. Craig received the award for its comprehensive system of inpatient and outpatient medical care, rehabilitation and long term, follow-up services. “There is a common thread that former patients and families use to describe their experience at Craig: They are treated like family,” said Hosack.